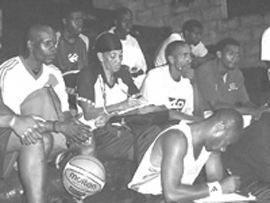 The SVG Basketball Federation has registered a male team to participate in the Caribbean Seniors Championships, scheduled to take place in Kingston, Jamaica, June 11 to 18, 2006. 32 players from all parts of SVG to try out for the National team. The purpose of the tryouts is to select players to represent SVG in Jamaica and to select a local based national team, and also to create a short list for overseas basketball scholarships. The SVG Federation intends to have a 10 -day training camp in Jamaica in an indoor facility, where final preparation of the team will take place, with the combined local and overseas players. Training camp will go from June 2 to 11. A committee has been appointed to prepare all aspects of St. Vincentâs participation, with chairperson, Sabrina Mitchell and other members Stanley Hinds, Dwight Lewis, Cecil Chin, and Wayne Williams.